Impact Public Relations Pvt. 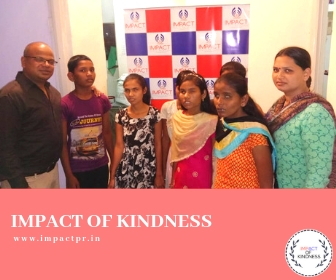 Ltd. launched "ImpactOfKindness" on the occasion of its 18 years celebration, an endeavor to give back to society through an act of kindness. The second initiative under this was done by our Sr. HR Manager, Mr. Syed, and Our social media executive, Ms. Arti Tiwari. Last week Mr. Syed visited an NGO called Blind Revival Development Association, located on the outskirts of Pune. A small NGO of 15 blind girls, run by a lady who does tailoring work and her husband is a driver. "I step inside the NGO and the feeling was beyond overwhelming. The guys were so welcoming and full of life. At the same time, they were also thankful for everything they have." Said Syed. The purpose of the visit was to help them out with basic amenities like grocery and clothes. The clothes were donated by Arti and the groceries were given by Syed. This small act of kindness helped those 15 girls in a really big way. Thank you, Syed and Arti for the amazing work! Special thanks to Kulpreet Freddy Vesuna & Freddy Vesuna.